Drawing on years of working with social entrepreneurs, conversations from across the globe, and lessons from case studies of its Social EnterPrize recipients, a new report from the Trico Foundation, “Building on Getting Beyond Better” (BonGBB), calls for a rethinking of how we see the intricate yet inescapable interaction between the social and the entrepreneurial that is “social entrepreneurship”. 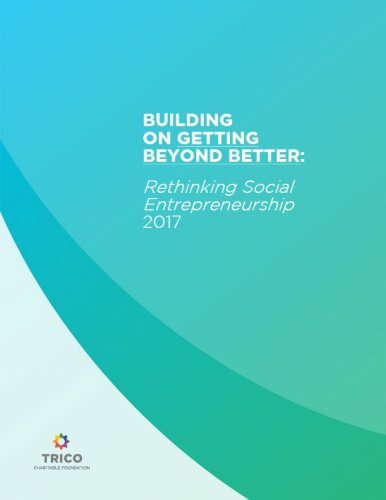 A rethinking that could impact how we see – and help – social entrepreneurs in their operation, evolution, use of grants, and collaborations. BonGBB suggests there are two basic ways the social and the entrepreneurial can blend in social entrepreneurship: 1) the degree to which the social model addresses the customer’s needs and 2) how the social model impacts market value. In turn, each of these basic blends can take one of three forms: a blend that is disconnected, a blend that is consistent and a blend that is synergistic. These patterns form a blend matrix (what we call the Blender) that is surprisingly effective in diagnosing the challenges and opportunities any social entrepreneurship will face as a result of its social and entrepreneurial blend. It’s exciting that fully appreciating the blends of the social and the entrepreneurial enable us to predict the pressure points and momentum social enterprises will encounter. That said, BonGBB argues these tools must be used with caution. Just because a social enterprise has a blend that will have challenges does not mean it should be disregarded. Some social enterprises, just from the act of doing and learning, can evolve new and amazing opportunities. The concept of the “adjacent possible” is useful to explain this phenomena. The adjacent possible states there are only so many opportunities directly possible at any given time, but that number changes after an opportunity is seized. For example, inside the standard classroom there is typically only one door. Go through that door into the school hallway and the choice of doors grows considerably. As Steve Johnson beautifully puts it, “boundaries grow as you explore those boundaries”.